Each year, I show the documentary film 'Peace One Day' to fourth year undergraduates in 'Becoming Posthuman'. I saw a premiere of this first in Glasgow, at the GFT. The screening was followed by a live link up with Jeremy Gilley, director, presenter, author and just about everything associated with POD. The film tells the story of POD, Gilley's mission to get the UN to recognise a specific day in the calendar dedicated to the cessation of conflicts. His pursuit takes him to the Sydney Olympics in 2000 and the United Nations in New York on September 11, 2001. It's a powerful movie about the difference one person can make to the world and the importance of not getting too bogged down in the pursuit of this. Did Gilley's film change the world? Yes. Are our expectations of change too great? Yes. 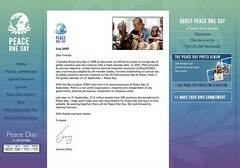 Today, the UN recognizes the 21st September as the global day of peace. Gilley and his supporters throughout his process made that happen and yes, conflicts still occur on that day. Afterthought: surely there's some marketing mileage for Peace one Day in the acronym 'iPOD' ie: taking individual responsibility for bringing about peace, especially since their main event is an annual concert.